A man, a woman and their dog have been rescued by Coastguards after they became stuck up to their knees in mud at New Brighton. Liverpool Coastguard started taking 999 calls from members of the public at about 2.40pm on Tuesday 22 July 2014 reporting that the group were in difficulty near the Egremont Promenade. The Hoylake and Crosby Coastguard Rescue Teams, along with two Coastguard sector managers, were sent to the scene. The fire boat and specialist Merseyside fire units were also asked to attend. When rescue teams arrived, they found that the couple were stuck up to their knees not far from the river and were struggling to move. The dog was also unable to free itself. 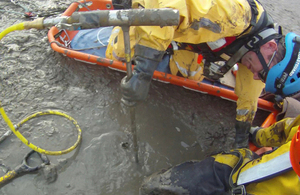 Using their specialist equipment, Coastguards were able to dislodge the mud around each of them and free their legs. They weren’t badly hurt, but the woman was taken to hospital to be checked over. Despite the warm and dry weather we’ve been having recently, there are still plenty of muddy patches along parts of our coastline that we need to keep a lookout for.